Fourth Row Center: Film Writings by Jason Bailey: On DVD: "Knight and Day"
So why did it underwhelm? Some blamed the generic title (seriously, that could be a title for any story, and has precious little to do with this one), or the forgettable marketing campaign (which seemed bound and determined not to exploit the recognizable faces of its fading stars). But the conventional wisdom, which may very well be true, is that Tom Cruise and Cameron Diaz simply can't open a movie anymore, even teamed up in a popcorn-friendly package. Tastes change, audiences are fickle, and there you go. But what of the movie, you ask. Well, it feels kind of like what it is: a filmed deal, slick and engineered, trying perhaps a little too obviously to be mirthful and high-spirited. Is it enjoyable? In spots, absolutely. We'll skip the plot summary altogether; they don't appear to pay it much mind, so there's no good reason that we should. The thin story primarily exists as the bulletin board on which to tack set pieces and romantic interludes; director James Mangold is going for a fast-paced, elegant globetrotter in the Hitchcock style, complete with a McGuffin for everyone to pursue (here it's "the zephyr," a self-sustaining energy source the size of a 9-volt battery). Our heroes zig-zag from Wichita*. to Boston to the tropics to Austria to Spain, dodging bullets and trading quips and falling in love. It's all highly constructed and more than a little convoluted, but that's not an insurmountable issue; the same could be said for To Catch a Thief or North by Northwest. The trouble may very well be that Mangold plays it too straight--he's skilled, and has got a light enough touch, but he's not a stylist, which is what a movie this preposterous needs. His best films (Walk the Line, Cop Land, Girl, Interrupted) were firmly tethered in the real world; he doesn't have the right goofy energy to bring this material off. He's also undone by some of the worst CG action sequences in recent memory. The emergency landing of the commercial jetliner is patently unconvincing, and the same goes double for the car chases, in which people leap around like animated characters and the vehicles jump and roll like they're in a video game. You can do ridiculous stunts and have them look convincing--the James Bond movies used to do them all the time. These action sequences are borderline laughable. Performances are hit and miss. Viola Davis is too interesting an actor for a role this dull, and I don't know what the hell accent that is that Peter Sarsgaard's doing, but I'm not buying it. But Paul Dano isn't playing an irritating mope, for once, and fills his role nicely. Diaz is passable--she isn't asked to do much, and doesn't, really. (She really should have convinced someone to eliminate just a few of those scenes where she has to talk to herself, which people never actually do.) That leaves Cruise to carry most of the weight--which he does, surprisingly enough. The guy may be certifiable, and a few years past this kind of roguish hero bit, but damned if he doesn't deliver; it's a rich and clever comic performance, delicately dancing the line between dangerous and funny ("I'll kill myself, and then her!"). His Roy Miller is a confident optimist, giving his frightened companion constant reassurance (when they're kidnapped, she wakes up to find him shirtless and bound, swinging upside down; he gives her a cheerful "I know this looks bad! "), though prone to bouts of amusing petulance when he's questioned. His chemistry with Diaz is good (they previously appeared together in Vanilla Sky), though their beach-fight-turned-flirt is painfully awkward. Through the rest of the film, though, they're believable enough--they look great together and develop a nice rhythm, and that's pretty much the job here. Knight and Day works very hard to look breezy, and you can see the flop sweat all over it. But Cruise is continuing to develop his comedic chops; his performance has an effortlessness and unpredictability that the picture itself never quite nails. His charm eventually takes the film over; Knight and Day isn't a great movie, not by a long shot, but it's a decent enough piece of popcorn entertainment. 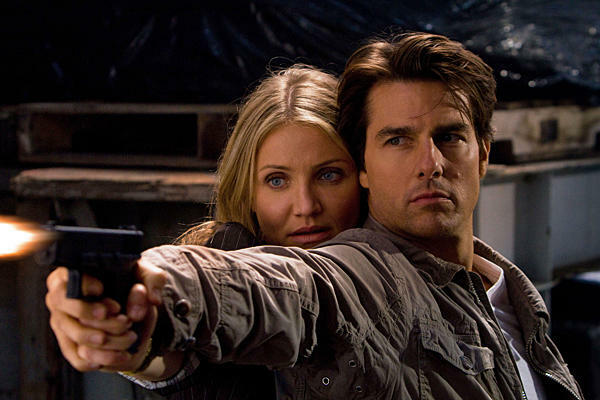 "Knight and Day" is available now on DVD and Blu-ray. For full A/V and bonus feature details, read tihs review on DVD Talk.